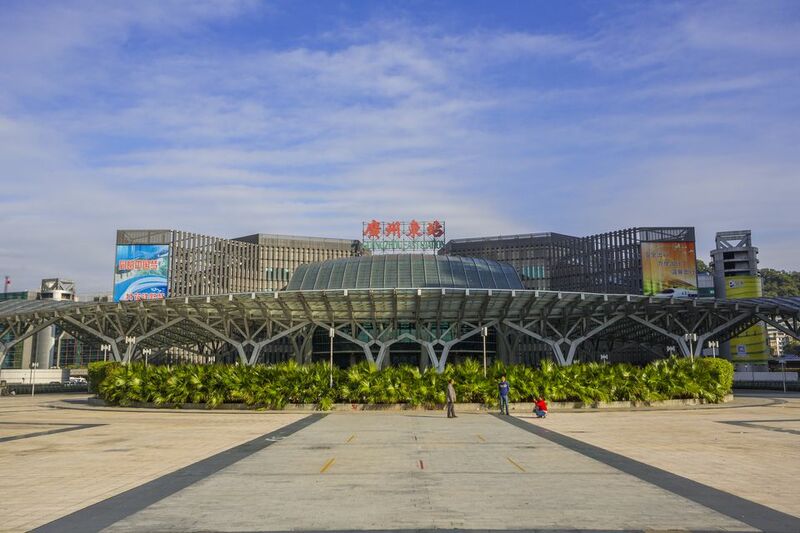 Guangzhou East Railway Station is one of the city’s international train stations. Alongside provincial trains to Shenzhen, Dongguan, and other Guangdong destinations, the station is the main terminus for the regular Guangzhou to Hong Kong train route. Set just on the outskirts of the city center, the station is well connected by metro and only ten minutes by train to the Canton Fair. The East railway station is Guangzhou’s gateway to Hong Kong and Shenzhen. This is also the right station for trains to Shanghai, but not Beijing. The high-speed train between Beijing and Guangzhou arrives in Guangzhou South Station. Other intercity trains to cities in China may depart from either of these stations or Guangzhou North. Just outside the main city center, the railway station is easily reached by metro; both metro line 1 and 3 serve the station. The Guangzhou Metro is easy to navigate and well signposted in English. There is also a huge number of buses outside the station but almost all information is written in Chinese and it may be difficult to work out where you are going. If you are arriving at the station and want to take a taxi, ignore the taxi touts inside the station. Straight outside the building is a real taxi rank or cab stand manned by guards where you can get an honest fare. It will be useful to have your destination written down in Chinese characters – most taxi drivers will not speak English beyond a handful of the major hotels. Tickets for the Guangzhou to Hong Kong trains can be purchased at the station on the first floor or from China Travel Service outlets. Tickets can be purchased on the day of travel. You can find out more in our Hong Kong to Guangzhou by train article. Hong Kong and China have a full international border and a handful of countries will require a visa for Hong Kong. Your Chinese visa is not valid for entry into Hong Kong. It’s also worth remembering that you will be leaving China and you will need a multiple entry visa or new visa to re-enter. The station is modern and well maintained. Most of the information, especially that relating to the Hong Kong route, is posted in English and some staff will speak English. There are also a lot of international travelers, including many Hong Kongers, who will be able to point you in the right direction. There is plenty of seating inside the station if you need to wait for your train. There is no actual tourist office and most of the people offering information are either taxi drivers or salesmen for hotels – both are best avoided. You’ll find ATMs and money exchange offices and there are also left luggage facilities. There is also a good selection of shops and cafes to fill up in before you travel. The station is safe, although you should be aware that like many international train stations pickpockets do prowl.